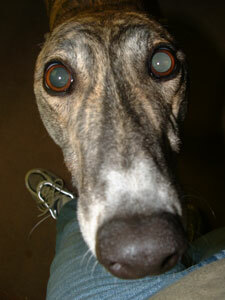 Spread the word about greyhounds as pets. Help out at Meet & Greets. Have decals on your car. Have business cards with you when you walk your greyhound. Adopt more than one. Consider adding a senior dog to your home. Every greyhound who makes it to a home helps make this world a better place. There is a constant influx of dogs at Almost Home for Hounds. The majority of these dogs have been bred for the racing industry and either have not qualified for, or have finished, racing careers. AHH dogs have a broad range in age from under 12 months to over 10 years, most fall within the 18 month to 3 year bracket. Occasionally Dr. Weir ends up with Coyote Dogs, these are greyhound mixes that have been bred for the sole purpose of hunting Coyote's to keep the population under control. Every dog that leaves AHH will receive Veterinary care, including spay/neuter, dental, vaccinations, worming, and initial grooming, before being released to waiting adoption groups or adoptive homes. If you, or your adoption group, would like to have AHH dogs please Contact Us for further information.